September 2nd is National Day, the day of Vietnam’s independence, and the day during which, at least in recent years, Vietnam has granted amnesty to select prisoners. I was pleased to learn last week that Vietnam will release upwards of 18,000 prisoners this year. However, I was greatly displeased to learn that not a single one of those 18,000 is expected to be a political prisoner. I wonder, if you met, face-to-face today, one of the countless media, labor, land, democracy, religious, or other activists that the current Vietnamese system has imprisoned, would you know it? I have a theory that, when put in the same, bustling room, one would have no easier a time discerning between an activist and a non-activist than discerning between strangers on a crowded street. Activists, in all their forms, wear no uniform, bear no special marking on the outside that singles them out. Their distinguishing feature is their beliefs-- and their actions. They have been made to stand out in society because the Vietnam system criminalizes freedom of expression. The manufactured labels of prisoner or judge, good or evil, are what truly single out Vietnamese activists. 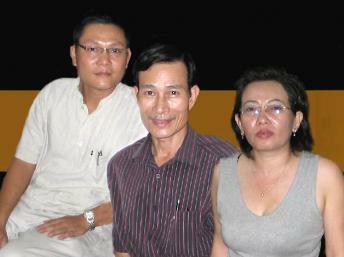 In fact, I believe that there are probably actually many similarities between you and a Vietnamese activist. Both of you undoubtedly have loved ones, dreams and goals, and likes and dislikes. Perhaps you both grew up in the same region, share the same favorite food, or are both avid fans of a particular sports team. When one really digs into it, I would wager that the dissimilarities actually are far less apparent than are the commonalities. For example, maybe you have worked in the business sector or have started your own small business. Indeed, before getting arrested, Tran Huynh Duy Thuc, who is serving 16 years in prison for his writings, founded an Internet service provider company. Do you often work on projects with your family? They have been campaigning for his release since the start. Thuc’s elderly father has been extremely involved– traveling, interviewing, meeting with officials, and more, to raise awareness for Thuc’s case. Wouldn’t you do the same for your children? Then take Bui Thi Minh Hang. She’s a mother, blogger, and activist, serving a three-year sentence. It’s certainly difficult to be away from family. This is Hang’s second time in prison, the second extended period of time being away from her children in the past five years. And of course there’s Ta Phong Tan, a blogger and former police officer serving ten years in prison. She knows what it’s like to lose a loved one. On July 30, 2012, Tan’s mother, Dang Thi Kim Lieng, died after setting herself on fire in protest of Tan’s detention. I ask you, as you think of National Day and its tradition of amnesty, to think of Thuc, Hang, and Tan not as prisoners, but as people, people with faces, and names, and families, and stories. 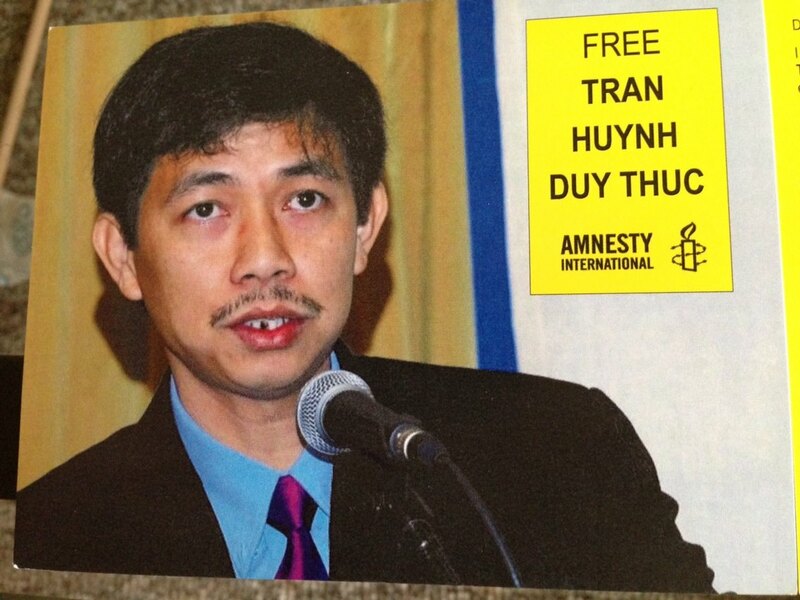 I ask you to work to release them and all those activists currently in prison in Vietnam. For just as your child may have a poster of a rock star hanging on their bedroom wall, somewhere a child has a photo or newspaper clipping of Thuc, or Hang, or Tan. 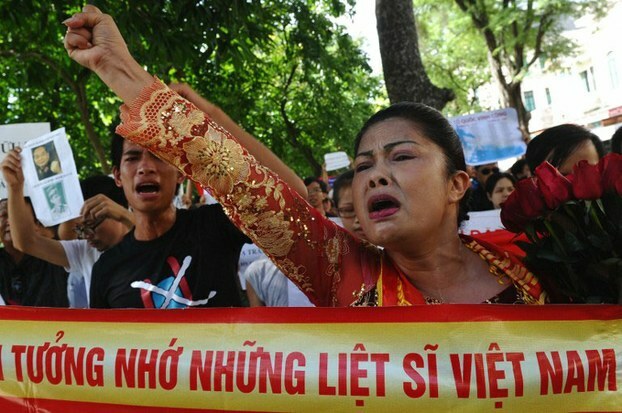 Activists in Vietnam have inspired action, brought hope, and spoken up for those who cannot. They are mothers and fathers, husbands and wives, sisters and brothers, sons and daughters, friends, mentors, neighbors, and heroes. I challenge you, when your son or daughter comes to you to ask about activists, what will you say? Will you call them prisoners, liars, extremists, or rebels? Or will you call them by name? And would you yourself be willing to persecute your own kin if they followed Thuc or Hang or Tan down the path towards freedom of expression?